West Side Story Event homeBuy ticketsCustomer reviews HamiltonThe PromNetworkTo Kill a MockingbirdKiss Me KateHadestownOklahoma! In 1957 the Great White Way became home to a landmark musical that was conceived by three of America's greatest creative talents. 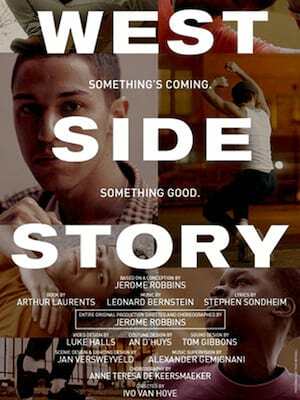 Written, directed and choreographed by iconic ballet master Jerome Robbins, with music and lyrics by celebrated composers Leonard Bernstein and Stephen Sondheim, West Side Story set Broadway alight with its instantly memorable jazz-tinged score, innovative choreography that redefined modern ballet and sweeping romance story. Now the two-time Tony-winning production returns to New York City in a brand new revival helmed by award-winning experimental theatre director Ivo Van Hove and produced by EGOT winner Scott Rudin. 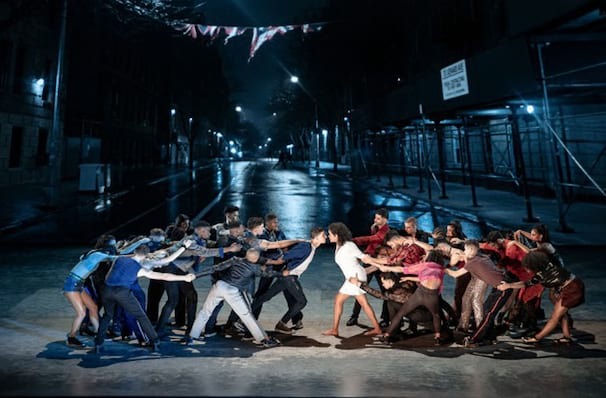 The exciting new adaptation sees Hove direct a Broadway musical for the first time, as well as all new choreography by avant-garde contemporary dance master Anne Teresa De Keersmaeker, a bold union that heralds a West Side Story for the 21st century. What Is West Side Story About? Originally set in Hell's Kitchen in the 50s, Hove's adaptation is sure to depart from its source material in more ways than just choreography, but the heart of its story resonates as strongly now as it did when it first debuted. Based on Shakespeare's Romeo and Juliet, our star-crossed lovers are Maria, a Puerto Rican immigrant and Tony, a young Italian-American. Their fate is sealed when they first lock eyes at a neighbourhood dance, falling hopelessly in love. But it quickly becomes clear that the violence of the community they live in has forced them to opposite sides of the war between the Sharks, a gang of American Puerto Ricans and the Jets, a gang of white Americans, what with Tony being the former leader of the jets and Maria the sister of Sharks leader Barnardo. Tensions between the two gangs escalate, leading to a pre-arranged "rumble" - a fist fight that goes awry when switch blades enter the fray. After Tony accidentally kills Bernardo in retaliation for the murder of his friend Riff, the action reaches boiling point and the ensuing racism and bigotry harboured by both sides end in tragic, ultimately fatal consequences for Tony and Maria. West Side Story's accolades extend far beyond the stage, with its subsequent feature film garnering a whopping ten Academy Awards. Its soundtrack also spent 54 weeks at the top of the Billboard chart, which was 17 more weeks than Micheal Jackson's mega smash Thriller. Sound good to you? Share this page on social media and let your friends know about West Side Story at Venue To Be Announced. Please note: The term Venue To Be Announced and/or West Side Story as well as all associated graphics, logos, and/or other trademarks, tradenames or copyrights are the property of the Venue To Be Announced and/or West Side Story and are used herein for factual descriptive purposes only. We are in no way associated with or authorized by the Venue To Be Announced and/or West Side Story and neither that entity nor any of its affiliates have licensed or endorsed us to sell tickets, goods and or services in conjunction with their events.